Knowing the basics of cat care will help you take excellent care of your cat. Having a cat or kitten is indeed wonderful. Cats give you lots of love and companionship. At the same time, your cat depends upon you for his or her food, care and safety. Your cat needs a safe home, a healthy diet, quality time, and of course, lots of love. This page is filled with information on cat care, safety issues and other useful tips. Safety is an essential element of cat care. Here’s a list of tips that will help you prevent accidents in your home. Do you you live in a multistory building or a high-rise? Is your apartment located in the higher floors? Then make sure that your cat does not have access to open windows. This precaution will prevent your cat from jumping and falling, which can cause injury and even death. Protect your windows with a strong screen or guard, and make sure that they stay firmly secured at all times. Even if you don't live in a tall building, keep your windows secured. It will prevent your kitty from slipping out. Cats love enclosed spaces and enjoy hiding out! One of my cats loves getting into my closet. Always be alert: check your closet, drawers, chests, pantries, and other potential hiding places before you close or lock the door. Unfortunately, your cat might get injured if he gets trapped. Cats love quiet and contained areas. It is not uncommon for cats to hide inside dryers and washing machines. Check the interior of these machines before locking and/or operating them. Unplug or cover electrical cords as cats love chewing or playing with them. Cats can get seriously injured by an electrical shock. Cats love playing with strings, ribbons and dangling cords. Keep ribbons and yarn in a safe place. Also keep the cords of your blinds and drapes tightly secured to prevent your cat from getting entangled. How many stories have you heard about cats being trapped inside garbage disposals? Protect garbage disposals, and especially keep switches covered to prevent serious accidents. Keep hazardous substances like cleaning fluids, insecticides, laundry detergents, and antifreeze - among others - out of the reach of your pet. Also keep medications in a safe place. Cats love bags. They love playing with both plastic and paper bags. And they look so adorable when doing so. However, plastic bags can be dangerous to your cat. She can rip them apart and ingest the shreds. Cats can also get easily entangled, so keep plastic bags of your cat's reach. Paper bags are safer, but it is a good idea to supervise your cat whenever she plays with one. Check for objects your cat might topple. Cats love jumping onto furniture. And by doing so, they might cause any object (even a heavy one!) to tip over and fall. To prevent accidents, remove any breakable and/or valuable objects from your kitty's path. Always keep your cat away from the stove, especially when you are cooking. Keep pantries and cabinet doors closed. Whenever I open my apartment door to go out, my kitties are right behind me. I have to be extra careful so that they don't follow me outside. Cats are curious by nature and want to know what's beyond the door. Never leave your house door open and ensure your cats stay safely inside. Also ensure that your cat is never left inside a locked room. This happened to one of my friends. She accidentally locked her cat inside of her bedroom and she didn't know until she came back from work. Grooming is another important aspect of cat care. Even though cats take good care of themselves, they still need our help. Below you'll find several grooming tips. Cats are clean by nature and they will groom themselves every day. However, cats ingest a lot of fur during their grooming sessions. The excessive ingestion of fur causes hairballs. To help reduce or alleviate this problem, it is a good idea to brush your cat two or three times a week. Personally, I like to brush my kitties every other day. In extreme cases, you may also bathe your cat. If you decide to do so, make sure that you use a cat-safe shampoo. Of course, most of the time cats will not need a bath. Trimming your cat’s nails is another important part of your cat’s grooming. You can find inexpensive nail-clippers especially made for pets. You can even find kits that come with nail files, trimmers and storage case. Dental health is another important element of your cat’s general well-being. You can help kitty stay healthy by brushing his or her teeth on a regular basis. Yes, there are toothbrushes designed for kitties, and you can easily find them online. Never use human toothpaste, though. You can find toothpaste especially made for cats at many pet stores. Visit our cat grooming page for more tips. Very important: Be sure to remove stools from your cat’s litter box every day! Cats can be very fussy when dealing with a dirty litter box. Litter needs to be replaced when wet, smelly and/or dirty. Here's more information about litter boxes. A balanced diet is essential to your cat’s health; therefore, make sure that you give your cat all the necessary nutrients. A cat diet must include protein, vitamins and minerals. Fresh water is another important component of your cat’s daily diet. So it is critical to provide your cat with fresh water every day. Do not give your cat alcohol, soda, chocolate, coffee, tea, yeast dough, avocado, or any other human food for that matter. Human food can be dangerous to your cat. Some of these foods can be poisonous to felines. And never give bones to your cat. He can easily choke on them. Consult your veterinarian to obtain more on information on what is the best diet (and feeding schedule) for your cat. Visit our cat diet page for more information on this topic. Have your cat examined at least once a year. Your cat needs a thorough check up to detect any abnormalities or signs of disease. Your cat also needs to have his/her vaccinations updated on a regular basis. Keep in mind that preventive medicine is the best medicine. Don't forget to vaccinate your cat against rabies. You should also have your cat tested and vaccinated for both the feline leukemia virus and the feline immunodeficiency virus. Keeping your cat indoors will also help prevent these and other feline diseases. To learn more about your cat’s health consult your cat's veterinarian. Spaying and neutering are highly recommended. Neutering refers to the surgical removal of a cat’s reproductive organs (females are spayed and males are castrated). Neutering/spaying your cat will not only prevent annoying behavior, but it will also prevent serious medical problems. Neutering/spaying will also help to reduce overpopulation. 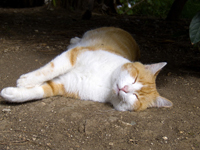 Many cats (and dogs) are put to sleep every year due to this serious problem. Caring for cats may seem like a daunting task, but it's not. Just follow these tips, and you'll be on your way to giving the best cat care to your feline companions!